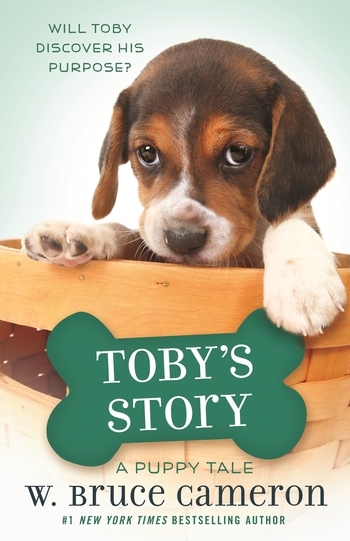 Meet Toby—a very special dog with a very important purpose—featured in A Dog's Journey, soon to be a major motion picture! Young readers will love this story in the popular A Dog's Purpose Puppy Tales series by bestselling author W. Bruce Cameron. Toby is a beagle who doesn’t seem to have a purpose. While all of his littermates are adopted right away, Toby is left behind because he's not as energetic as they are. But because he is so quiet, he is adopted by a girl named Mona and her mother, who works at a nursing home. As Toby comforts the residents of the home, he discovers that his purpose may be the most important of all! Toby’s Story is another uplifting tale of the bond that exists between humans and their cherished animal companions. Young fans of Ellie’s Story, Bailey’s Story, Molly’s Story, and Max’s Story will welcome this new addition to the bestselling series. Includes heartwarming illustrations by Richard Cowdrey and a reading and discussion guide at the end of the book. W. BRUCE CAMERON is the New York Times bestselling author of A Dog's Purpose, A Dog's Journey, A Dog’s Way Home, and the A Dog's Purpose Puppy Tales series for young readers. He lives in California.